Have you ever sent an important e-mail or tweet only to realize you just made an embarrassing typo? Do you find yourself typing the same greetings, signatures, or lines in e-mails and corporate memos all day long? If either of these scenarios sounds familiar, you may want to look at a text expansion utility such as Breevy. Breevy can import TextExpander snippets and AutoCorrect entries from MS Word, as well as synchronize with Dropbox. Breevy's main job in life is to help you type less, and with greater accuracy. It does this by using abbreviations. For example, type bgr and Breevy could expand that to "Best regards, your name." It is easy to create such abbreviations, and Breevy ships with helpful examples. 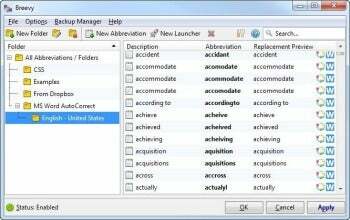 The idea of text expansion is not a new one, and existing utilities include PhraseExpress and free and powerful AutoHotkey. What makes Breevy special is its ease of use, compatibility with established standards in the text replacement world, and seamless Dropbox synchronization. Let's start with ease of use. AutoHotkey, my favorite text expansion utility, is basically a scripting language. As such, it is missing any sort of graphical user interface or other niceties that could make life easier for newcomers. While attempts have been made to make AutoHotkey simpler to use, the results I've seen do not approach the polish and friendliness you can find in Breevy's interface. Breevy lets you subdivide your abbreviations into subfolders to make them easier to manage. You can trigger an abbreviation just by typing it, or have Breevy await an end-of-word character (such as a comma, a full stop, or a space) or a special keystroke--by default, the Ctrl key on its own. Since text expansion is not a new idea, compatibility with existing standards is important. Breevy lets you import the AutoCorrect list used by your local installation of Microsoft Word with a single command, and it also supports the snippet format used by renowned Mac text replacement utility TextExpander. Last but not least comes Breevy's Dropbox synchronization feature. You can install Breevy on more than one computer, and link those computers using handy file synchronization service Dropbox. Once you do that, simply tell Breevy where your Dropbox folder is, and it would keep snippet repositories in sync across computers. When I tested this, abbreviations I defined on one computer instantly showed up on the other computer--no reloading needed. Breevy's snippet format strikes a fine balance between power and ease-of-use. Unlike AutoHotkey, it does not attempt to be a full-fledged programming language. It does, however, support variables--for example, you could have a snippet that pauses to let you enter a person's name, and then uses that person's name again later on. While Breevy's $35 price tag may seem a bit steep for occasional home users, if you do a lot of typing in any professional capacity and find AutoHotkey too close to programming to your taste, Breevy might be the text replacement utility for you.